Visio has two classes of shapes, affectionately known as 2D and 1D. 2D shapes are box-like. They have eight handles around the edges that allow you to change the width and height independently or at the same time. 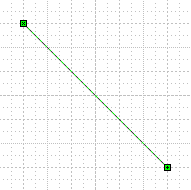 If you look real close, you can see that one end of a 1D shape has an “x” and the other end has a “+”. This is important for identifying the official Begin of the shape and the official End of the shape. Knowing which end is the Begin and which is the End helps you to enforce consistency across documents. One problem that arises comes from the fact that you can apply an arrowhead to either end of a line. 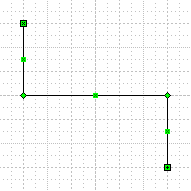 Here, all the shapes are drawn from (Begin) in the upper-left corner to (End) in the lower-right. But the arrowheads lead you to believe that they were drawn in reverse order: two from top-left to bottom-right, the others from bottom-right to top-left. If you are just trying to illustrate a concept, then Begin vs. End might not be that important. But what often happens is that the employees of an organization create many, many flowcharts. After they’ve drawn all these process, they then decide that it would like to program a tool to read information from all of their Visio documents. Code that looks for arrowheads to determine the direction of a shape is awkward and sometimes unreliable. It is better to properly structure documents using the official Begin and End of 1D shapes. It’s not that every user needs to understand the intricacies of 1D endpoint icons, but a corporate solution developer or shape designer could ensure that only the End can take an arrowhead, for example. Begin and End take on meaning in diagrams. For organizational charts, the Begin of a connector would be connected to the superior, the End to the subordinate. In a flowchart, Begin should be connected to the previous step, End to the next stop. In case you’re wondering about the x and the +, let’s take a small historical diversion for a moment. I believe the original design involved a theory that related the icons to real-life arrows. The “X” was what you saw when you looked directly at the tail feathers, and the “+” was what you saw when you looked at the arrowhead. I suppose that makes some sense…until you rotate the arrow 45 degrees! Seems to me the End should have been a dot to represent a point. 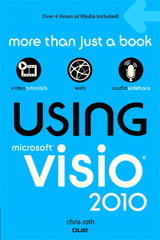 In Visio 2010, the x and + are gone. We now have two boring blue boxes, where the Begin is “hollow” and white. The 1D End looks almost the same, but has a gray filling. I think it’s about as visually clear as the x and + were, so I can’t really complain. This web site and others have hundreds of screen shots involving 1D handles that will suddenly become irrelevant to users of Visio 2010. 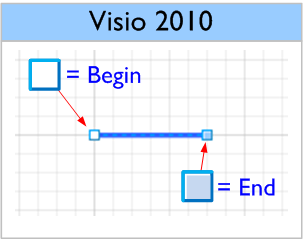 As new articles are written using pictures of Visio 2010, users of older versions of Visio will also be confused when finding information on the web. I hope articles like these will help clear up some of the mud! Why did they change the handles? The new handles look so similar it’ll be hard to distinguish. Change for the sake of change is not always a good thing. The best reason I can come up with is to make Visio look more and more like regular Office. 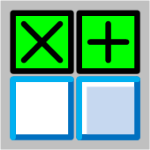 But after looking at PowerPoint 2010, well, all of their handles are more silver-shiny, BUT their rotation handle is a green lollipop…like Visio’s used to be. So PowerPoint has more Visio-like shape handles than Visio 2010?! But we could start a Top Ten list for fun. 6. Powder blue uses 3.216 less bytes than dark green to store in memory/disk. 7. The management consultants say we must all learn to embrace change. 8. Green handles (made from copper compounds) cost too much. Powder blue can be made from healthy blueberries. 9. In “The Great Gatsby”, the color green represented “hope”. We’ll have none of that! 10. Visio 2022 will feature handles in Soylent Green (Chris, please don’t name any child of yours ‘Sol’).